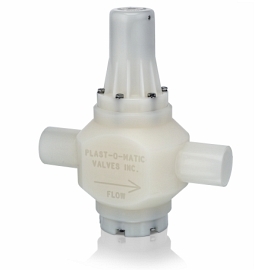 Pressure Regulators – Plast-O-Matic Valves, Inc. Accurately reduce and regulate steady or varying inlet pressures and maintain a constant, predetermined maximum outlet set pressure. Offered in spring controlled, air controlled, differential controlled and ultra-pure designs, Plast-O-Matic regulators are consistently recognized as the industry’s top performers for maximum flow with minimal drop-off from set pressure. ½” through 3”; for 4” consult factory. Already know your Part No.? Series PR/PRH/PRHM Downstream pressure reducing valve features large area rolling diaphragm, ultra-smooth operation and isolated spring control. Molded and machined valves in 1/4” through 3” (for 4” consult factory) and metric pipe sizes in popular thermoplastic materials with a wide range of connection types. Proven design provides highest flow with minimal pressure droop. While some valves may be limited by size or material, most models provide set range of 10-125 PSI. Series PRHU Downstream pressure reducing valve features metal ion-free EPDM large area rolling diaphragm, ultra-smooth operation and isolated spring control. 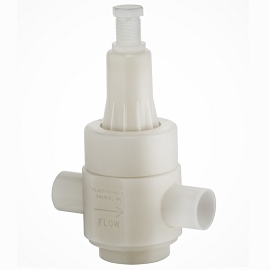 BCF spigots in 1/2″ – 3″ or 20 – 90mm sizes; Kynar 740 body and Class 100 clean/double bag procedure standard. 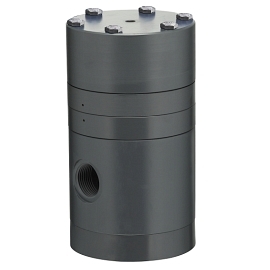 Provides highest flow with minimal pressure droop among high purity regulators; set pressure range 10-125 PSI. Series UPR Downstream pressure reducing valve features elastomer-free design (pressure will equalize in a no-flow condition) and the ultimate purity levels, as verified by independent test labs. BCF spigots, flare, sanitary, and other connection types available. 1/4″ – 2″ or 20 – 63mm sizes; choice of Kynar 740 or PTFE body. Class 100 clean/double bag procedure standard. Ultimate purity with excellent flow performance; set pressure range 5-100 PSI. 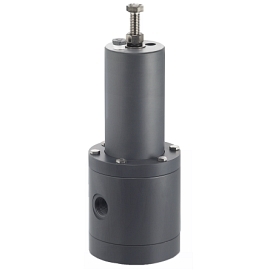 Series PRD/PRDM is a differential pressure regulator with a port for a downstream pressure sensing line. 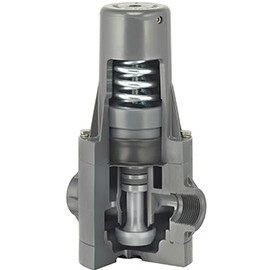 The sensing line feeds the pressure downstream of the equipment being protected to the top of the spring housing, which assists the spring in keeping the regulator open against the pressure directly at the regulator outlet. When pressure downstream begins to drop (as it would when a filter becomes more and more clogged), the regulator begins to close and becomes fully closed when the differential setting is reached. This assures against overpressure across the equipment. Molded and machined valves in 1/4″ through 3″ and metric pipe sizes in popular thermoplastic materials with a wide range of connection types. Differential set range 5-50 PSI. Series PRA/PRAM features two opposing large area frictionless rolling diaphragms. Process pressure is applied to one of the diaphragms; air pressure is applied to the other. 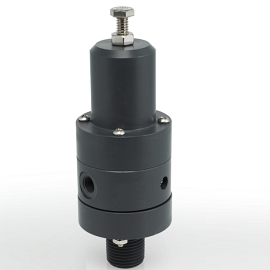 Because the air pressure can be maintained with more accuracy than the force provided by a spring, the PRA/PRAM offers greater sensitivity and less variance from set pressure than any thermoplastic pressure regulator previously available. The PRA/PRAM can be used in combination with Plast-O-Matic’s patented Stabilizer which measures downstream liquid pressure and provides continuous feedback control for even greater sensitivity and performance. Molded and machined valves in 1/4″ through 3″ and metric pipe sizes in popular thermoplastic materials with a wide range of connection types. Set range 5-125 PSI. Series PRS patented Stabilizer is used with Series PRA. The Stabilizer reacts to downstream liquid pressure and provides continuous feedback control to the compressed air supply, for even greater regulator sensitivity and performance.